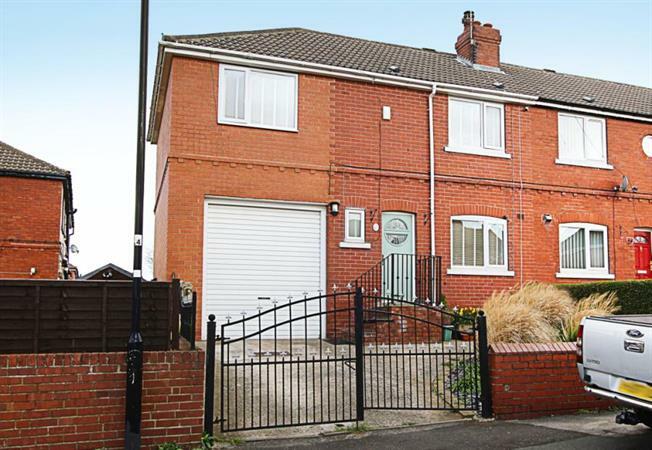 3 Bedroom End of Terrace House For Sale in Sheffield for Guide Price £130,000. Blundells are proud to bring to the market this fantastic extended three bedroom end town house in Aughton. Well-presented offering spacious accommodation throughout, boasting a driveway with double wrought iron gates, leading to an integral garage and landscaped gardens to the front and rear. In brief the accommodation comprises; to the ground floor is the attractive front facing living room having a feature chimney breast with a multi fuel stove and slate hearth and laminate to the floor. A door leads to the staircase rising to the first floor landing along with a further doorway accessing the dining/kitchen overlooking the rear garden, with a range of wall and base units, pantry and a stable style doors accessing the rear of the property. To the first floor landing is loft access, doors lead into all three bedrooms and a shower room. The master bedroom being dual aspect with both front and rear facing windows, double bedroom two having built in wardrobes and a separate storage cupboard, bedroom three also having a range of built in wardrobes and modern shower room having a wash hand basin, low flush wc and shower enclosure having electric shower within, tiling to the splash backs and ladder towel radiator. To the front of the property is a gated driveway leading to the integral garage which has power and lighting, electric door and a courtesy door leading to the rear superb enclosed landscaped rear garden which benefits from two brick built storage houses, flagged patio, a mainly laid to lawn and stocked garden, garden shed and a summer house, with decked terrace and Jacuzzi (available subject to separate negotiation). Aughton and Swallownest are popular sought after areas, known for excellent local amenities and Schools. Ideally situated for junction 31 of the M1 motorway network and ideally placed for links to Sheffield, Worksop and Rotherham. There are further amenities at nearby Crystal Peaks Shopping Centre, Drakehouse Retail Park and the area is well placed for both Ulley Reservoir and Rother Valley Country Park offering fantastic outdoor pursuits.